One of the great things about living on the West Coast is how established the Japanese classic car community is. 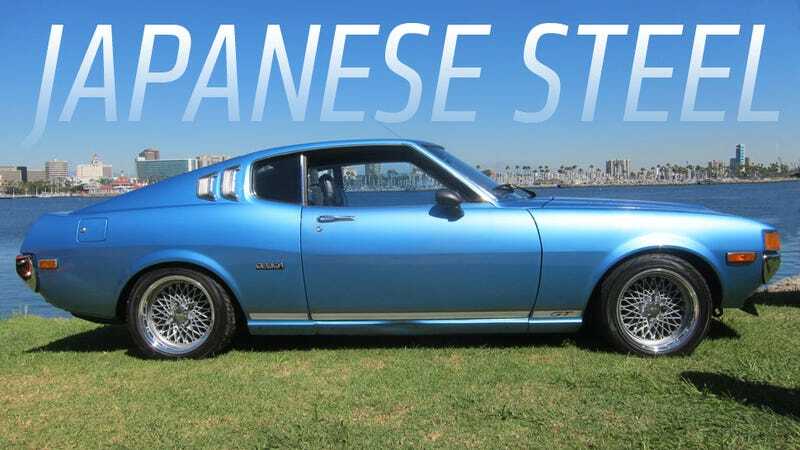 In many parts of the US, there's still people who laugh at the idea of a Japanese classic car show, but out in Long Beach this past weekend it was clear that Japanese 'nostalgic' cars are serious business indeed. There were a number of very-well maintined Mazda RX-2s. What really struck me about many of them were these huge, lavishly chromed turbo setups many of them had. Rotaries sure are odd looking under the hood. Also fascinating was something I've never seen before: a vinyl trunk. Mazda took the American vinyl roof affectation to its utmost extreme, allowing that luxuriant vinyl to cascade all the way down onto the trunk lid. It's sort of like an automotive mullet. Mazda's rotary-powered pickup trucks are real unicorns nowadays, so seeing one in this pristine condition is really something special. Plus, has there ever been better, more confusing to the layman text painted on a tailgate than "ROTARY POWER?" Those are some lovely Fairlady rear ends. Be careful describing this picture verbally if you're in an office. This may be the nicest captive-import Mitsubishi I've seen since I time-travelled to my job as an early '80s Dodge salesman. The second-nicest Dodge Colt I've ever seen was right next to it, and I finally really looked at that badge, and realized how it could easily have been the alternate-universe Mustang badge. I've always admired the way Japanese men seem secure in their masculinity and aren't afraid to challenge it a bit. For example, there's no way in hell you could have sold a sports car to men in the US with the name "Fairlady," written on the car in wedding-invitation script. This was a really incredibly clean example of a very novel, innovative, and often overlooked car. Those taillights are so '80s they're cool again, and that swappable-tailgate thing is great. Plus, it's a T-top shooting brake! What's not to like? Of course there were some fantastic old Skylines. I liked this classy brute an awful lot. Stick a fish-mouth grille and some vivid red paint on a 240z and all of a sudden you've got some odd, forgotten Ferrari. Early Japanese cars took a lot of styling influence from British cars, and this rally-prepped Prince 2000/Skyline sure has a lot of Cortina in it. Look at those taillights. How did this old Cressida wagon survive in such amazing condition? These cars were cheap family cars, and almost all of them met their dooms at the sweaty hands of the 16 year olds they were passed down to. This little wood-applique'd beauty is a great example of American design detailing filtered through a Japanese lens. And, of course, there were a few Toyota 2000GTs. These are genuinely stunning, and are now officially million-dollar cars. No Japanese car show can be complete without my favorite Japanese contribution to motoring, the Really Really Tiny Van. This Subaru Sambar was in perfect shape, and had some kind of exciting goings-on in the engine bay. Based on that massive exhaust capable of shooting Ikea meatballs and the exposed air cleaners, I bet this baby is putting out at least a massive 30 HP or so. Maybe 40. Honda sure wasn't afraid of color for the little Z Coupe. These things are a blast. The Z Coupe's more responsible brother is the Honda N600, which is sort of Honda's 2-cylinder answer to the Mini. Great little cars that got Honda's first foothold in the US. They really should have had a dropcloth around this one, just to catch all the messiness from all the blown minds this thing was causing. It's a 1993 Mazda Eunos Cosmo, and I've never seen one of these anywhere near this side of the Pacific. It's a 3 rotor, 255 HP (the maximum allowed in Japan at the time) twin-sequential turbo executive coupe with so much crisp Japan-market handsome classiness that it makes me want to spit expensive brown liquors. Any car show with Japanese rotaries needs to pay respects to the granddaddy of them all, the Mazda Cosmo Sport. I've always loved the look of these early Cosmos. What a refreshingly minty little Datsun. These things were so narrow. This GT-R's straight-six was so clean and purposeful-looking. I really feel old when cars I grew up with are now in "classic" car shows. My mom drove one of these Accords (well, an '80 — this is a '79) for most of my childhood, and one peek in the window put me back in a Boy Scout uniform, sitting in the back seat and giggling because my sister's pants made sounds like a fart. Some of these early Datsuns feel like what you'd get if a Volvo Amazon and a Dauphine made sweet, sweet love in an old Packard plant. This is still very close to the hypothetical little classic truck that lives in my brain-garage. What a great little wagon— contrasting-color roof, whitewalls, swamp cooler — there's no way you could have a bad day in that thing. For years these were just math teacher's cars, and most people never thought much about them. Now, in this context, it's easy to appreciate how clever and simple these things were. It'd be fun to have a nice, early-gen Civic. I'd never seen these old Toyota Stout trucks before, but I really like them. I especially like the strangely prominent turn indicators built into the hood there. These feel sort of like scaled-down '60s Ford trucks. I've also never encountered the pickup version of the classic Land Cruiser. It's like Japan's Jeep Scrambler! A pair of rugged little early HiLuxes, showing Japan's strange obsession with oversized turn indicators that look like fog lamps. Old Civics had similar ones. Any idea why? And finally, a telling study in how much of a difference clear headlight covers and a tapered nose can make for making a Datsun look Italian.